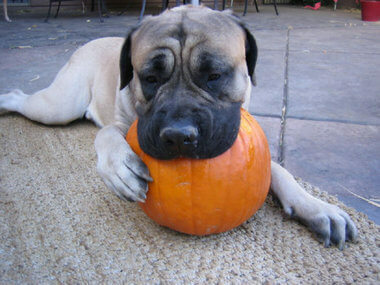 It may be time for lazy beach days and summer BBQ’s, but many of us in veterinary medicine have pumpkin on the brain. 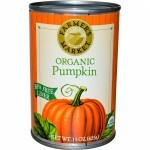 Once available only in autumn, canned pumpkin is now available year-round in grocery stores. 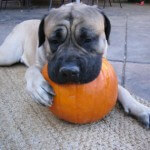 Why is pumpkin so important to veterinarians? Pumpkin is widely used as a source of dietary fiber for our canine and feline patients suffering from various gastrointestinal illnesses. Fiber-responsive diarrhea is a common syndrome identified in kittens and puppies. While Fluffy and Fido would turn their noses up at most other sources of fiber (Metamucil, bran flakes, psyllium husk), pumpkin has the advantage of being highly palatable. Most of our canine, and many of our feline, patients actually enjoy the taste! Many will eat pumpkin straight, but in some cases owners find better success in mixing pumpkin with food. We use pumpkin to treat many cases of both diarrhea AND constipation, which may seem counterintuitive. Since both loose stools and dry, firm stools seem to respond to increased dietary fiber, we recommend pumpkin in a good number of our patients with gastrointestinal illness. Why is pumpkin so effective? Pumpkin contains a large amount of fiber; fiber is any part of a plant that cannot be broken down and digested by the body’s enzymes. Dietary fiber is found in all plant-based foods, including fruits, vegetables, grains, nuts, beans and seeds. There are two types of fiber – soluble and insoluble – and most foods contain a combination of the two. As the name implies, soluble fiber is “soluble”, or breaks down, in water. Soluble fiber absorbs water from the digestive tract, forming a gel-like substance that slows down the digestive process. Soluble fiber is found in foods such as oats, peas, beans, apples, citrus fruits, carrots, barley, psyllium – and, yes pumpkin! Insoluble fiber adds bulk to the stool, thereby speeding up the passage of food through the digestive tract. Insoluble fiber is found in foods such whole wheat flour, wheat bran, nuts, beans and certain vegetables. The soluble fiber in pumpkin slows digestion, which is beneficial in the management of diarrhea. And, since it absorbs water, it “bulks” up the stool, helping to control the loose, watery stools characteristic of diarrhea. It is pumpkin’s water-absorbing quality that also helps for patients with constipation, by drawing moisture into the colon and loosening up the stools. 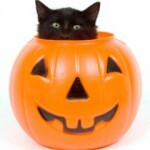 There are a few things to know before using pumpkin for your pet. First, only purchase plain canned pumpkin (not pumpkin pie filling, which contains sugar, nutmeg and other spices to make it taste so yummy!) Second, if your pet isn’t eating because they are constipated or have diarrhea, then pumpkin is not the solution; please schedule an appointment with your veterinarian to address the problem. Third, for those patients who have normal bowel movements, pumpkin may cause diarrhea. How much pumpkin should you give? Small dogs and cats should begin with 1-2 tablespoons daily; this can be increased or decreased depending on the stool quality. Medium sized-dogs can receive 1/4 cup of pumpkin daily, while large and giant breed dogs can receive up to 1/2 cup per day. The truth is, the dose of pumpkin is highly variable and really can be adjusted up or down to achieve the desired stool “firmness”. 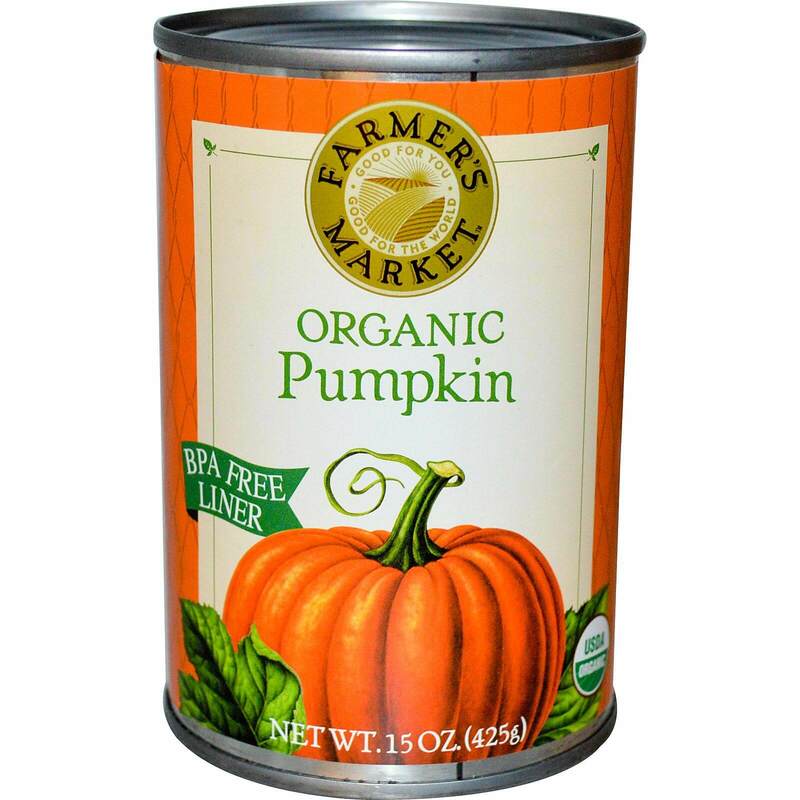 The best part about canned pumpkin is that it is inexpensive, readily available and has no significant side effects! I’m all in favor of medical treatments that have a major upside, with little to no downside; pumpkin definitely fits the bill.